When I read The Hole on the Gospel, I was quickly enamored by Richard's heart for the least. I loved getting to see his heart develop and God grow his desires to love and care for the world. It has been no different reading Unfinished. 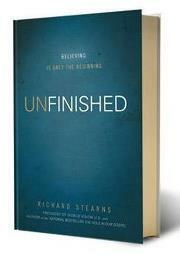 Richard reminds us that we are not deciders of the gospel, we are disciples. Our task is to do what it says. Our mission is to populate the kingdom of heaven. The church in our day has the knowledge, the funds, and every conceivable thing to take the gospel to the ends of the earth. The mission remains largely unfinished. The book is full of stories of ordinary people called to use what they had to share the gospel. Some were called to give up everything and some were called to better use what they had. The point is that we need to be on mission wherever we are or wherever God calls us to go. Read this book and challenge yourself.